Life has been going full throttle since school started. I feel like there has barely been time to take a breath. I was listening to this episode of the podcast Sorta Awesome the other night. My friend Kelly (Love Well Blog) is the co-host every couple of weeks, and they were talking about what it means to be an extrovert versus an introvert. It dawned on me just how much of an introvert I am. Kelly was telling the story of what she did on her kids’ first day back to school. She went to Target and then met a friend for lunch and they were able to hang out and talk all day, and she was totally energized by that. I had to laugh because I got my kids off to school, came back home and spent a heavenly day alone. I took a nap, caught up on some organizing, and I don’t think I talked to a single person all day. It was amazing. This is not to say that I am not a people person. I love getting together with my friends, and I get so much out of my time with them. When I really need to recharge though, I need my alone time. This can be really hard with two boys, a husband and a part-time job. I know I’ve been feeling the effects this week of being constantly on the go with little to no chance for quiet. I’ve been having random thoughts that go something like this: Wouldn’t it be great to just get in my car and drive? What I wouldn’t give for a hotel room all by myself with a few good books. I could just hang out by myself. Alone. By myself. I had the privilege tonight of listening to a friend who had a really tough week. She had finally reached her breaking point, and she went out walking by herself. 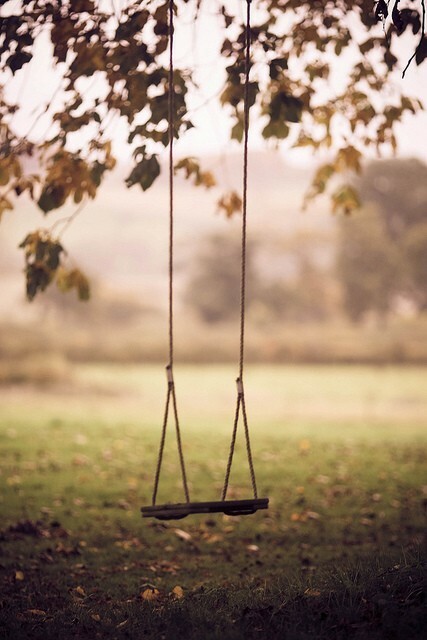 She found a swing, and she just sat and swung for a long time, and she was able to take solace in that little bit of time alone. It was a good reminder for me on these weeks when I am feeling like if I don’t get off by myself soon, someone is gonna get hurt, that I can do small things to get away and recharge. Even if it’s as simple as finding a swing for an hour. I can’t keep giving if my tank is empty, so finding the eye in the storm where I can put some gas in my tank is essential. I used to have mommy guilt over this, thinking that once I had kids, I had to give them all of me, all of the time or I wasn’t being a great mom. I soon discovered how much better I was at being a mom when I saved time just for me, and I was able to let go of the guilt and just enjoy my time alone. So, whether you are an introvert who longs for solitude, or an extrovert who craves some face time with friends, find your swing so you can recharge your battery and face the new day with renewed vigor.